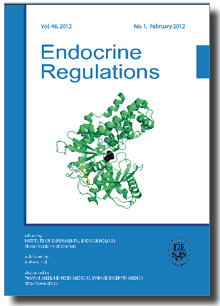 Endocrine Regulations (since 1967 to 1990 Endocrinologia Experimentalis) is an international journal on experimental and clinical endocrinology edited quarterly in English by care of the Institute of Experimental Endocrinology, Slovak Academy of Sciences (Bratislava, Slovakia) and published by the AEPress (Bratislava, Slovakia). This journal aims to publish original manuscripts or minireviews on experimental and clinical endocrinology and diabetes. The submission of a manuscript to Endocrine Regulations implies that it has not been previously published or is not being submitted for publication elsewhere and that the manuscript has been approved by all authors who are ready to take public responsibility for the content. All materials relating to human investigation will be published upon the understanding that design of the work has been approved by the local Ethical Committee or that it conforms to ethical guidelines of the Declaration of Helsinki. The animal experiments should state the conformance to guidelines on animal care.